AMUT and EREMA invite guests to experience the closed material loop of PET first-hand from 28 to 31 May 2018. Washed post-consumer PET bottle flakes will be recycled live at the AMUT headquarters in Novara, Italy, to make food contact grade thermoforming sheet in a direct process. This rPET sheet will be used at the Plast Milan exhibition – which is being held at the same time – to make thermoformed trays for the food sector. Interested producers will be able to process their own input material on the demonstration system in future to make plastic rolls. They can then test the samples later in their own thermoforming production to check the quality. AMUT and EREMA are holding an Open House to present a sophisticated “Bottle to Packaging” process and show that the desired closed material loop in the PET sector is already reality. The post-consumer flakes are processed in the new demonstration facility – a direct combination of VACUREMA® technology and the AMUT Inline Sheet plant – in a single process to make food contact grade thermoforming sheet. “Energy savings, IV preservation, lower logistics and process costs lead to higher profitability and are unbeatable arguments which are driving the trend towards direct food grade PET processing,” says AMUT President Piergianni Milani. Thanks to the direct combination of recycling and production technology there is no longer any excess process stage. This is because the melt goes straight from the VACUREMA® to the AMUT plant without the detour of pelletising. “The Open House visitors will hold food contact grade thermoforming sheet produced from 100 per cent post-consumer PET bottle flakes in their hands – without even the slightest amount of virgin material added,” says Michael Buchberger, Sales Manager for the Bottle sector at EREMA. A free shuttle service between the trade fair in Milan and the AMUT headquarters in Novara will be available for attendees. The 100 per cent rPET sheet will be used to make thermoformed trays for the food sector at the AMUT booth 111/112 in Hall 13 during the Plast Milan show. The demonstration facility in Novara will continue to be available for customer trials also after the Plast Milan show. “Our VACUREMA® technology is currently in use on 61 Inline Sheet facilities around the world. You have to be able to rely on the upstream and downstream process, especially in the case of direct processing. 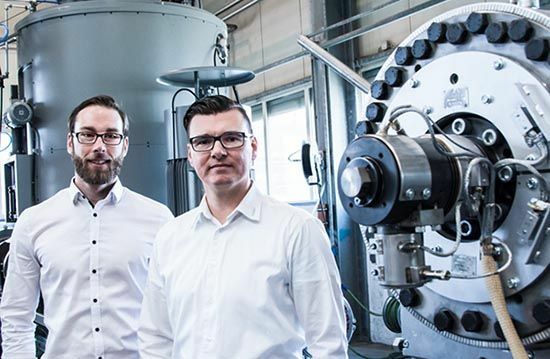 With AMUT we are delighted to have found another long-term partner in the Inline Sheet sector,” says Buchberger. If you are interested in attending this Open House, please register with Pamela Provera at p.provera@amut.it or Claudia Legawiec at c.legawiec@erema-group.com. If you wish to decide at short notice, it will also still be possible to register during Plast Milan at the AMUT booth B111/C112 in Hall 13 or at the EREMA booth 121 in Hall B 15.